Listening to the radio is something that will never go out of fashion, and DAB radios prove just that. In a digital world, everything is changing, and that includes the way in which we listen to the radio. 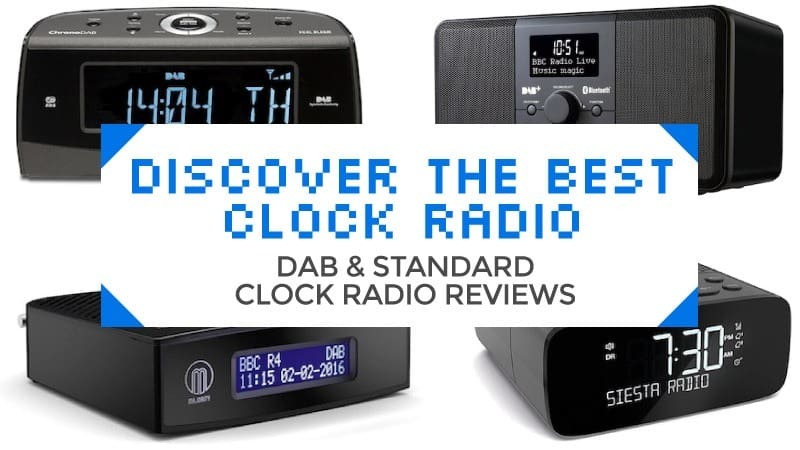 Whether you are looking for a standard or a DAB radio, we have a range of clock radio reviews that are sure to pique your interest. Take a look and see for yourself. A lot of the choice when it comes to DAB and standard clock radios is down to personal preference. There are so many different types on the market that is can sometimes be a little tricky to choose the right one for you. However, here are a few of my personal tips for choosing your perfect radio. The first of these is deciding if you want a DAB or standard clock radio. The former of these is digital, allowing you access to more radio stations than you can imagine, the latter offers less stations and on an FM frequency. It also makes a difference in terms of the distance a station can be accessed from. Naturally, DAB can access stations from further away than the standard FM. So, if a standard radio can reach the stations you like in your home and you aren’t too bothered about access to thousands of stations, FM is the best choice for you. Often, a standard clock radio is cheaper as well. The point of a clock radio is to wake you up in the morning for work or other events, and so you need to make sure it comes with an alarm. The type of alarm, however, is all down to personal needs. A dual alarm system means that you and your other half can have alarms set for different times, which can be quite handy. Many also have weekend settings if you fancy sleeping in or not getting up at all. It’s always handy to have a snooze button that you can reach easily as well to avoid morning frustration. It may get us up faster if we cannot find the button, but it’s not a good start to the day. There’s loads of extra features as well that you should keep in mind. Things like Bluetooth for streaming your music, and portability if you want to take it out with you. Plus, a headphone jack can be handy for personal listening. To top it all off, you want to make sure it looks good in your home as well – design is very important. Much of this section is DAB vs Standard (FM), and more detailed pros and cons are listed in the main product section with each individual item. However, here are a few advantages and disadvantages for DAB and standard clock radios, to help you as you try to figure out which one you want. When you go to choose a DAB or standard clock radio, there are a few things you should look out for. The first and most important is that the more expensive models are not always the best - price doesn’t always mean quality. It’s important to research the models you are interested in and take a look at online reviews for guidance. They can be really handy. You should make sure the radio you are buying is right for you and your needs. If you want something simple and a little less tech orientated, a standard clock radio might just be a better fit for you. However, if you want a load of extras and multiple alarm functions as well as thousands of stations, DAB might be the better port of call. Look for quality in the products you buy. Go for trusted brands that you know are reliable and come with warranties if anything should happen to them. The big brands might be a little pricier, but it is worth it for a product that works and is protected against unexpected malfunctions. Plus, they tend to have more reviews that you can reference when you go to purchase one. This cannot be put into one way, there are so many different ways you can use a DAB or standard clock radio. Of course, you can use it as an alarm for the morning, as well as a soothing way of falling asleep at night to your favourite station. This is the most common way to use a DAB or standard clock radio. You can also bring it down to the kitchen or other rooms so that you have some company in the form of radio shows while you cook or go about your day in general. Similarly, you can use it for entertaining guests or even bring it to the homes of friends and family for some group listening or background noise. Plus, if it comes with Bluetooth you can stream your own music through it. Always make sure you read the instructions when you are setting up a clock radio, and ensure that you have everything required to get started. You should also make sure that it comes with a mains plug that is right for your country, and that the model sent to you was made for your region. Once the instructions are read, you can set up and get started with your new radio. All that’s left is to choose the perfect one for you. Take a look at our clock radio reviews for some of our favourite models. This funky DAB clock radio from Ocean comes with a fantastic wireless WiFi connection to the internet radio, allowing you to access 25,000 stations across the world for no extra charge. It has a colour display with the date and time, and can also support FM radio. There is a headphone jack for more intimate listening, and it comes with a range of languages for you to choose from, so if English is not your native tongue you don’t need to worry. It has an alarm clock feature, allowing you to set the alarm as well as put it into snooze or sleeper mode. With a remote so that you can control it from a distance, it makes a great bedside companion to help you fall asleep as well as wake up in the morning. 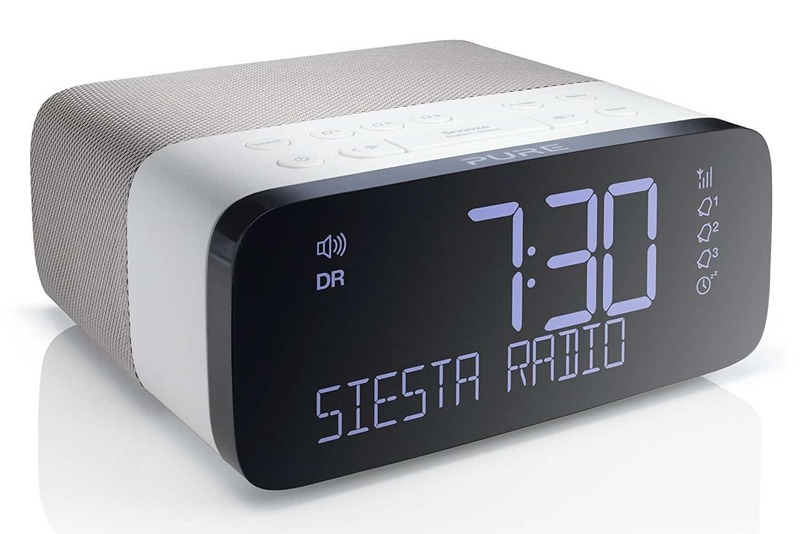 This could be one of the best DAB clock radios. With 25,000 stations available across the world, it is perfect for radio globe hopping. So no matter where you are you can listen to your favourite international stations. Despite its short comings, it offers superb value for money and with the language selection as well, it doesn’t matter if English is not your first language. 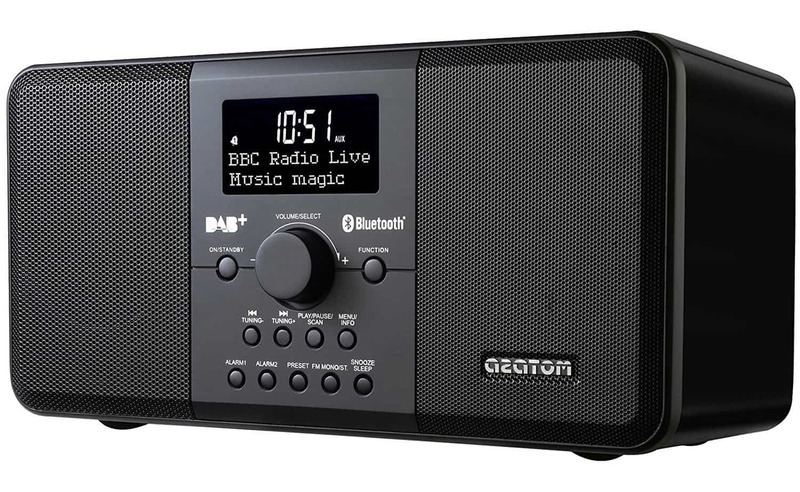 A great DAB radio for those who want something reliable and inexpensive. Q: How many alarms are there and can the alarm be set to take input from the USB port? A: Comes with 2 alarm settings and with sleep timer function. Sorry it doesn't support input from USB port. 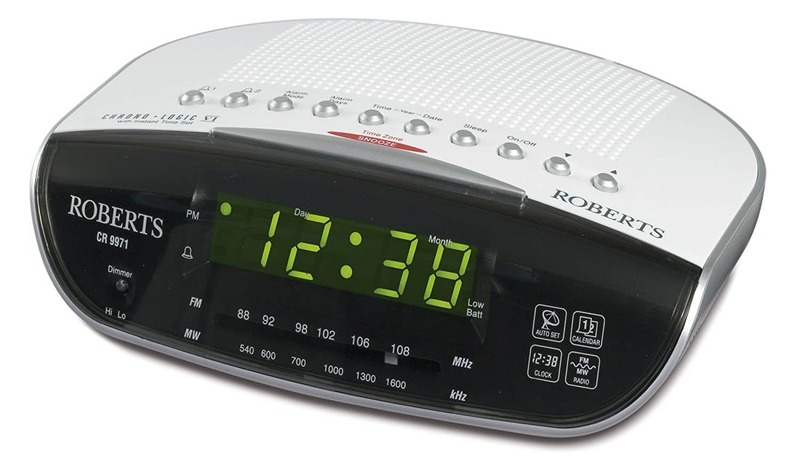 Roberts is a popular and reliable brand, and their clock radio is a great example of this. It offers a great range of radio stations for easy listening and comes at an incredibly affordable price. It automatically switches the time in the summer and winter, so you don’t need to worry about changing the time when the clocks go forward or back. It has a dual alarm, so that you and your other half can have your own times to wake up, plus a weekend mode for a well-deserved lie in. There is also a sleep timer and snooze button that are easy to access. This FM clock radio is a great and affordable addition to any home. It has a small, lightweight design as well as a good range of stations for your listening experience. Plus, with a dual alarm and a weekend alarm mode. It has a few flaws, and if you go to a different time zone it will switch automatically to UK time, but generally it’s great bang for your buck and will do a good job of waking you up in the morning. This DAB clock radio has a huge list of stations for you to choose from, so there is something to satisfy every mood. Plus, it also has FM radio, so you can still tune into the stations that have yet to go digital. The display is easy to read, but adjusts its brightness according to the light in the room, so you can always read it but it will never keep you awake. The clock is intelligent, adjusting itself automatically according to daylight savings. Even after a power cut it will go back to the settings you gave it in a flash. There are so many great settings, like waking up either to your favourite station or an alarm tone. It has three alarm settings to make things easier for you, as well as a snooze button and sleep timer. It even has USB charging. While on the slightly higher end of the price spectrum, this is a great piece of kit that is worth investing in. It has a wide range of radio stations, three alarm settings, and automatic time adjustment – making everything that much easier for you. Plus, with USB charging you can ensure your e-reader or mobile device gets charged up overnight. It has a cool look and sits wonderfully on your bedside table. Well worth the cost. 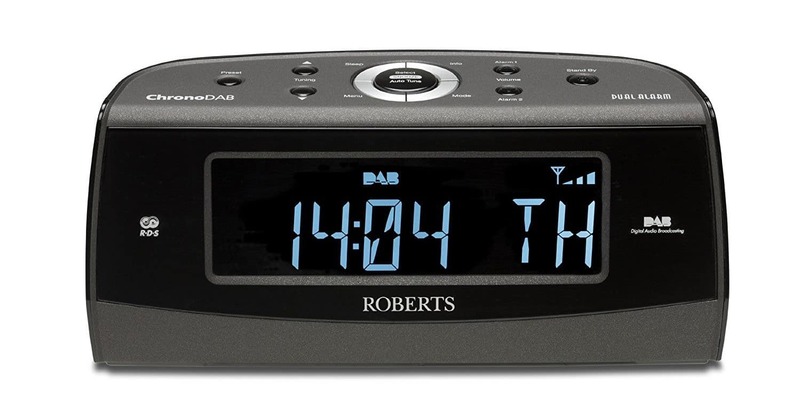 This DAB clock radio from Roberts sports a sleek black design that goes nicely with any bedroom set. 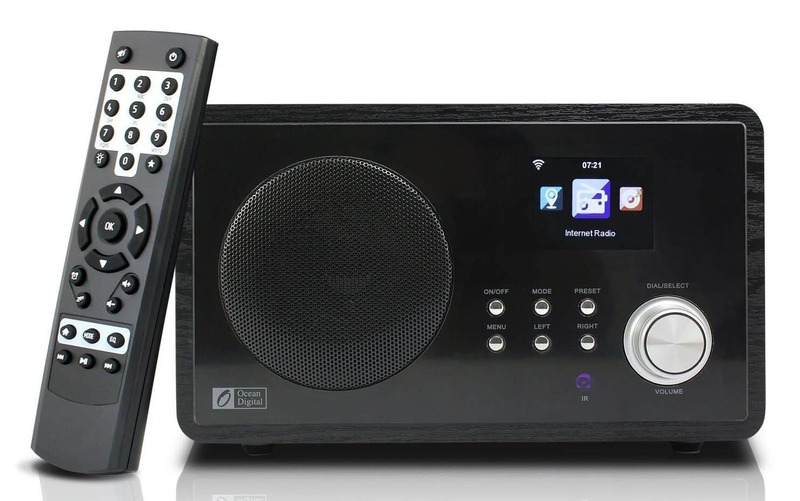 It has both DAB and FM radio, so you can definitely listen to your favourite stations without any trouble. It also has an automatic station search. The LCD display is very large and easy to read in any lighting, and it can be further adjusted in dim light or when the radio is in standby. The alarm settings are really easy to use, and there are multiple ones available. This is perfect for those who like to get up at different times, as well as for sleeping in at the weekend. Each alarm can be set to sound daily, weekly, or on weekends, and you have the option for either the classic alarm buzz or your favourite station to wake you up in the morning. This cool DAB radio sits nicely on your bedside table and it has a great number of stations for your flick through, so there is something for everyone. With multiple alarm settings and an easy to read LCD screen, getting up in the morning is sure to be much easier. While it has a couple of niggles, it’s one of the best clock radios available and well worth a try. This funky portable DAB radio has a rechargeable battery so that you can take it anywhere you want. It can be used for ten hours without a main power supply, so you’ll be all set for a night of fun and entertainment. It has DAB and FM radio, meaning that all of your stations are accessible for your listening pleasure. It has Bluetooth 4.0 so that you can stream music from your smartphones, laptops, and other Bluetooth compatible devices. It has exceptional sound quality, and is ideal for any room in the house. Plus, there is even a headphone jack if you want a more intimate listening experience. It has a dual alarm clock and the display is easy to read with accessible brightness control, all at a reasonable price. This is a great clock radio for those looking for a midrange priced product that is reliable and works well. It has a fantastic range of features, from a dual alarm to brilliant Bluetooth 4.0 so that you can stream your own music if you don’t feel like listening to the radio. Despite its disadvantages, this radio makes for an excellent purchase and can be places anywhere in the home with no issue. The best DAB clock radio has to be the Ocean Digital model. It has everything you need to have the perfect listening experience. With 25,000 stations to choose from and 11 languages in the settings, it has a great deal to offer and at a great price. There are no issues with the sound quality, and while it can only store one WiFi setting, this is only a nuisance if taken out frequently. It has everything you need to wake up in the morning, or to be your companion around the house while you go about your day. With a range of settings and a headphone jack for private listening, it’s a great one to go for and all at a reasonable price. What did you think of our clock radio selection? Are there any you would have added? We love hearing from you, so feel free to leave a message in the comments below.